Return to the Kanto region and experience a classic Pokemon journey in a whole new way with Pokemon: Let's Go, Pikachu! and Pokemon: Let's Go, Eevee! These two titles were created by GAME FREAK, the developers of the Pokemon core RPG titles. Pokemon: Let's Go, Pikachu! and Pokemon: Let's Go, Eevee! introduce a new play style that anyone can enjoy, combined with the fun of collecting Pokemon. Pokemon: Let's Go, Pikachu! and Pokemon: Let's Go, Eevee! are based on Pokemon Yellow: Special Pikachu Edition, which first launched in Japan in 1998. These updated versions have been reimagined to make the most of the unique capabilities of the Nintendo Switch. The games also capture the fun of Pokemon GO and its intuitive Pokemon-catching mechanic. Pikachu will be with you wherever you go, either hanging on your shoulder or riding on your head. Don't let their adorable expressions fool you into thinking that cuteness is all they offer, though. Your partner will be a dependable ally in battle, too. In addition to determining your first partner Pokemon, there will be some differences in the species of Pokemon that you encounter and the rate at which you encounter them based on whether you choose Pokemon: Let's Go, Pikachu! or Pokemon: Let's Go, Eevee! The games utilize the abilities of the Nintendo Switch to add new and more accessible ways to experience Pokemon and play in the Pokemon universe. Even those who have never played the Pokemon series before will be able to dive right in-Pokemon: Let's Go, Pikachu! and Pokemon: Let's Go, Eevee! are easily approachable for newcomers to the series, but also have enough depth to keep veteran Trainers on their toes. The practice of catching Pokemon has been changed dramatically from previous titles. Now you can use your Nintendo Switch's Joy-Con to toss a Poke Ball at your target with one hand, either by pressing a button or flicking your wrist. With fewer buttons and intuitive action, it's never been simpler. Pokemon: Let's Go, Pikachu! and Pokemon: Let's Go, Eevee! also feature two-player simultaneous play. By sharing one of the Joy-Con controllers with a partner, two players can adventure at the same time. Throw Poke Balls together when you encounter Pokemon to boost your chances of successfully catching them, or have a friend lend a hand by joining you in battles against Trainers in your game. To really capture the Pokemon spirit of these titles, the new Poke Ball Plus accessory allows you to interact with the games like never before. The Poke Ball-shaped device can be used to play Pokemon: Let's Go, Pikachu! and Pokemon: Let's Go, Eevee! in place of your Joy-Con. In addition to motion controls, the device lights up with a variety of colors, vibrates, and plays sounds. When you try to catch a Pokemon, you'll feel it moving inside its Poke Ball, and if your catch is successful, you'll even hear the cry of the Pokemon you just caught. As a controller, the Poke Ball Plus will bring a new level of fun and immersion to these games. But the Poke Ball Plus does more than just function as a controller. Take one of your favorite Pokemon from these games for a stroll in your Poke Ball Plus, and you can bring it with you as you go about your daily life in the real world. You can spend time with your Pokemon even when you're not playing Pokemon: Let's Go, Pikachu! and Pokemon: Let's Go, Eevee!-and you'll be rewarded in various ways when you return them to your game. Plus, the Poke Ball Plus works as a Pokemon GO Plus. That's a lot of pluses for one little Poke Ball! There is a deep connection between Pokemon GO and Pokemon: Let's Go, Pikachu! and Pokemon: Let's Go, Eevee! For one thing, Pokemon originally discovered in the Kanto region that you have caught in Pokemon GO can be brought into these two new Nintendo Switch games. That's not all, though. Look forward to more details at a later date. 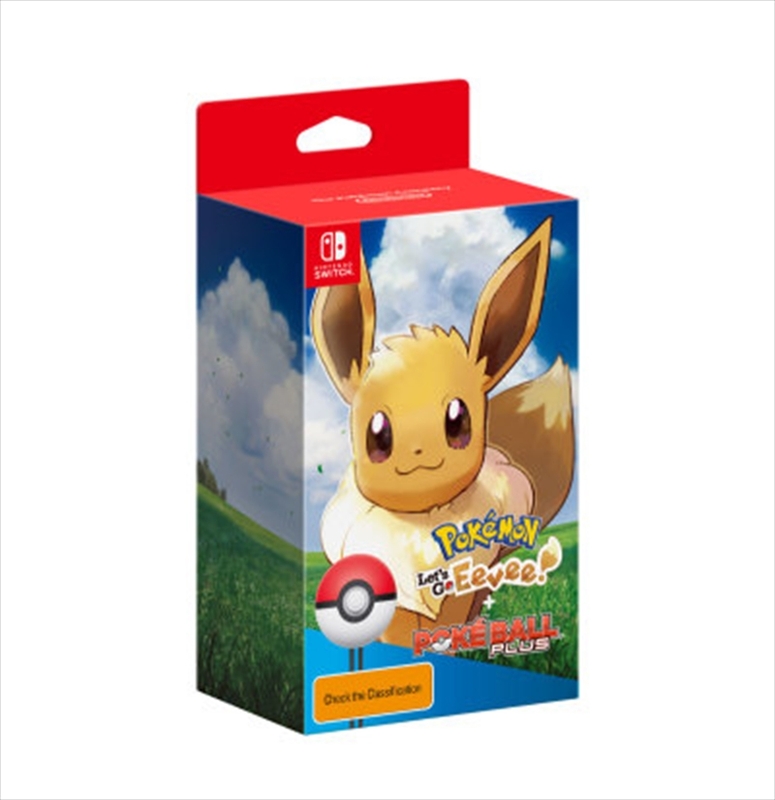 Whether you're a longtime fan or you're taking your first steps into the world of Pokemon, Pokemon: Let's Go, Pikachu!, Pokemon: Let's Go, Eevee!, and the Poke Ball Plus provide a captivating way to experience the adventure.